Experience the superior precision and performance of laser tracking technology. 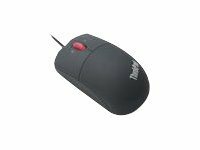 Delivering extraordinary control on virtually any surface, the ThinkPad USB Laser Mouse offers improved tracking accuracy and smoother navigation over traditional optical mice.Scroll through documents, spreadsheets, and more with increased accuracy and precise control with this exclusively contoured and customizable three-button Laser Mouse. A 1600 dpi laser sensor and programmable tilt wheel with four-way scrolling offer unparalleled performance and reliability.